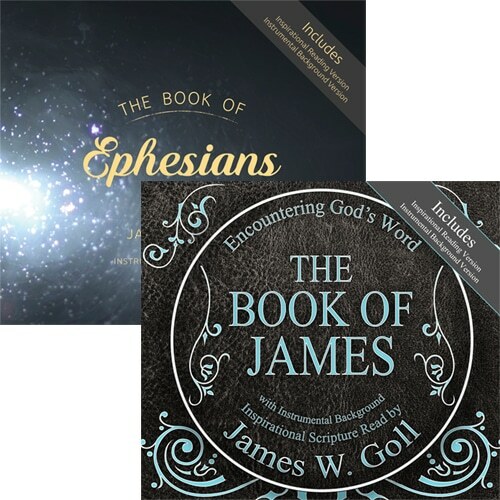 Buy both and save up to $15 when you purchase this Audio Bible Bundle of The Book of James & The Book of Ephesians on CD or MP3 read by James W. Goll! Includes bonus instrumental only tracks by McKendree Tucker! Buy both and save up to $15 when you purchase this Audio Bible Bundle of The Book of James & The Book of Ephesians on CD or MP3 read by James W. Goll! Gathered together on the first day of the week, the early church was a community driven by love, built upon the resurrection power of Jesus, and driven by the Holy Spirit. One would share a song, and all would join in praising God, all would celebrate God, and all would pray. In the midst of the Body of Christ, they would gather together to hear the Word read aloud. Whatever scrap of a Gospel, or Apostolic letter, all would be read – God’ s love letter to His people. That taste of the early church is also available here, modernized. Whether for meditation, memorization, comfort or study, “The Book of James” is an opportunity to sit at home – gathered with family, even – and experience the Word read aloud as the earliest believers did. And God will meet you here. The early church was a community driven by love, built upon the resurrection power of Jesus, and driven by the Holy Spirit. All would pray and praise to God. In the midst of the Body of Christ, they would gather to hear the Word read aloud. Whatever scrap of a Gospel, or apostolic letter, all would be read – God’s love letter to His people. That taste of the early church is also available here, modernized. Whether for meditation, memorization, comfort, or study, “The Book of Ephesians” is an opportunity to sit at home – gathered with family, even – and experience the Word read aloud as the earliest believers did. And God will meet you as James W. Goll recites the “Book of Ephesians” to help you encounter the Word.